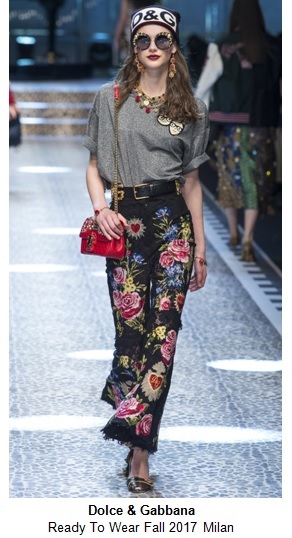 As Miranda Priestly (played by Meryl Streep) in The Devil Wears Prada famously quipped: "Florals? For Spring? Groundbreaking." 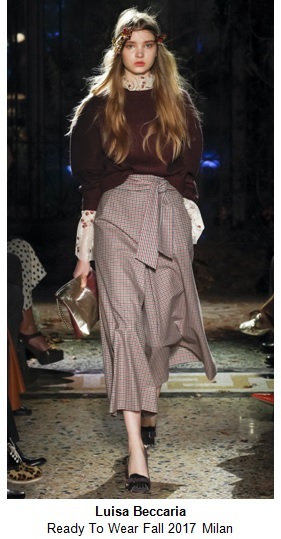 However the just-wrapped Milan Fashion Week showed just how florals can be innovative when worn in Fall and Winter. Amidst a backdrop of classically autumnal hues, flower motifs look bold and smart. 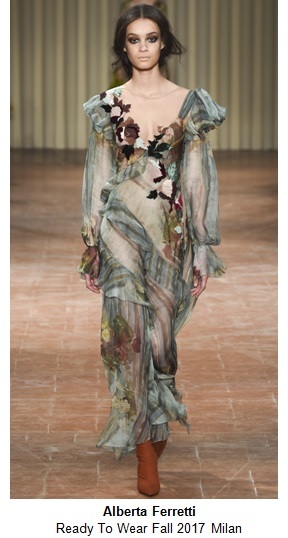 A gauzy gown with floral appliques actually looked perfect for Fall, given the brown and blue overtones used at Alberta Ferretti. Bluemarine updated the off-the-shoulder cocktail dress by giving it a sheer long sleeved built-in top with a floral pattern matching the flirty frock. The rose could practically be the mascot for Dolce & Gabbana due to how much as it's incorporated in their collections each season. Fall/Winter 2017 was no exception, and here the flowers were shown on a casual look, embroidered onto denim. 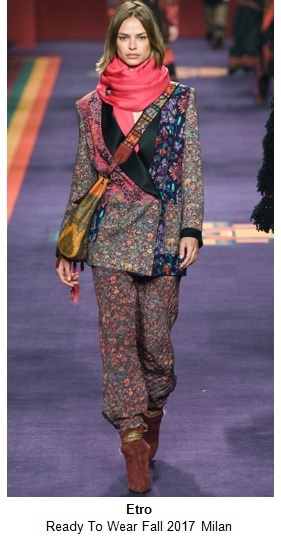 Etro's world-traveler inspired collection featured a mashup of prints and textiles. Their re-imagined tuxedo jacket represented this theme with floral panels in darker hues. 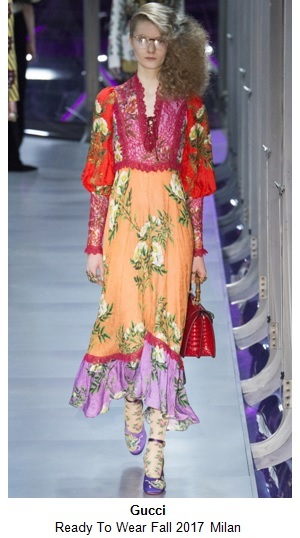 At Gucci, Alesandro Michele took a look into the fashion house's history and used the floral prints from scarves in the Gucci archive. 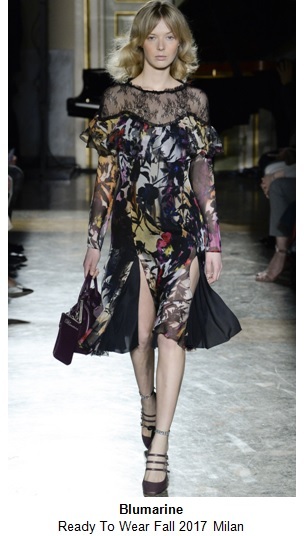 In this look from the runway, the flower power was doubled by pairing the dress with printed tights. The entirety of the ethereal Luisa Beccaria collection had flowers incorporated into it. Most models even wore flower crowns. This particular look was striking in the way the sheer floral shirt was styled to peek out from under the sweater of the traditionally Fall outfit. No. 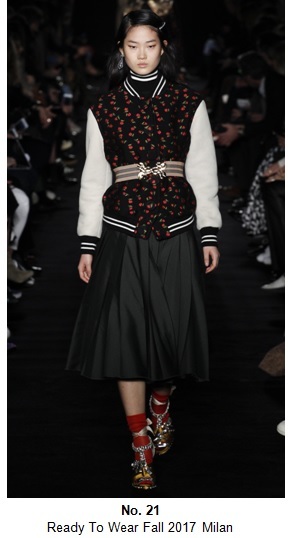 21 took the classic bomber jacket and added miniature roses. The red color popping over the black background is a fresh look for outerwear. The gorgeous kick-flare silhouettes at Prada invoked a femme fatale. 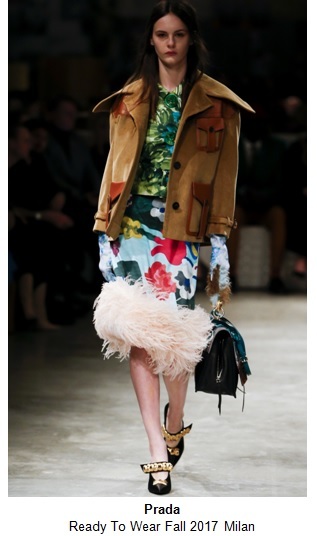 The painterly floral print on many of the pieces were able to uphold that theme due to their pairing with feathers, and boxy coats that look like they mean business. The best part about the floral trend for Fall/Winter is that your Spring and Summer pieces can pull double-duty. When layered and paired with darker hues, flowers will bring an unexpectedly chic edge to your cool-weather wardrobe. You might even say that it is groundbreaking.